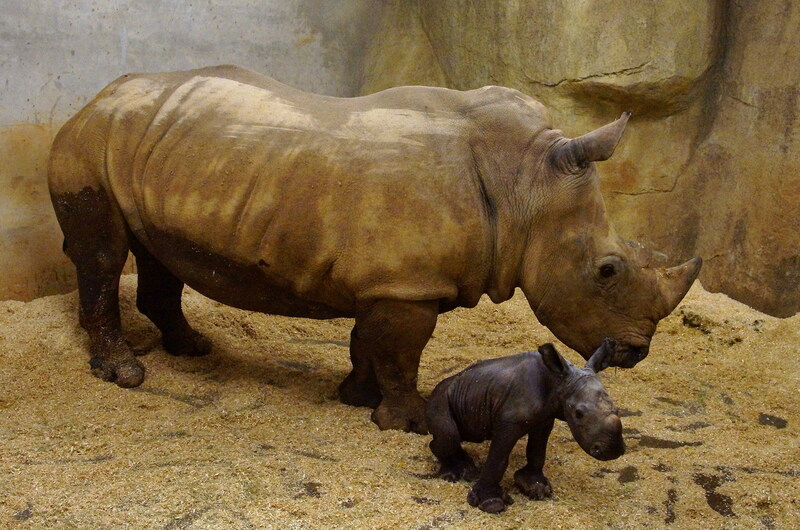 A male white rhinoceros calf was born on the 2nd of February 2013 at Taipei Zoo! The newly born baby is the son of Xi-Chun (mom) and Xi-Wang (dad). The joyful moment of his birth was recorded by an infrared camera and is shared on the Taipei Zoo YouTube channel. The white rhinoceroses are the largest species of land mammals after African and Asian elephants. Both white rhinos and elephants have long gestation periods. The gestation period of the white rhinos is approximately 16 to 18 months, while the elephants take 22 to 24 months. In order to predict the delivery time more accurately, Taipei Zoo had been monitoring the changes in mother white rhinoceros’s hormones in stool, and other biological data. On the day the mother white rhino, Xi-Chun, gave birth to her calf, the zoo keepers witnessed the mother beginning to secrete milk in the delivery room. The floor of the room was pre-covered by soft sawdust for her and her baby. Before Xi-Chun gave birth to the calf, she had begun to walk around constantly from 5:40 p.m. After a period of time waiting, the forefoot of the calf appeared at 7:02 p.m. Then the whole body of the calf slid out at 7:13 p.m. It is the first time for Xi-Chun to become a mother, but she has done well in nursing her baby. She is alert whenever a stranger is nearby. She even refused the keepers offering her a back massage with the long-handled brushes which was her favorite treatment. 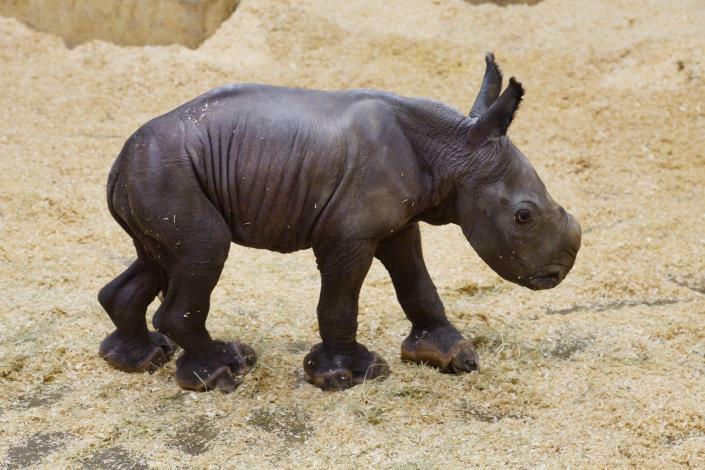 The baby of Xi-Chun is the second white rhino born in Taipei Zoo. It has been twenty-six years since the first rhino calf, Xei-Hui, was born at Taipei Zoo in 1987. The birth of Xi-Chun’s calf is truly pleasant, warm news in the Chinese New Year. If the weather is good in the coming days, the Zoo will consider introducing the calf to the public. Before the calf shows up at the outdoor enclosure, the keepers will copy their observation diary on the white board beside the white rhino’s enclosure. Physical description: The white rhinoceros is the largest species of land mammal after the elephant. Their head and body lengths are about 335-420 cm, shoulder heights 150-185 cm and a tail of 50-70 cm. They are 1440 to 3600 kg in weight. Males are larger than females. They are usually light gray to dark yellow.